It's hard to believe Summer has nearly come and gone. Soon it will be time for State Fair, then back to school, and HARVEST! We've had a fantastic summer and cannot thank YOU enough for all the support. With the 'firsts' now out of the way - Grand Opening, First Event Hosted, and First Live Music Played, we are busy preparing for the start of harvest and wine making. Sunday, August 21st - Vinyl Vagabonds will be playing Live in the Loft from 2-5 pm. Come out for a rockin' show by Stratford Native! Sweet Treats Ice Cream from Jewell will be serving their delicious homemade ice cream as well - we can't wait! Friday, September 2nd - Brad Morgan will be playing Live in the Loft starting at 6:30pm! Thursday, September 8th - Creative Spirits will be back at the winery to paint 'Harvest Moon' at a special rate of $30. Check out our Facebook Page for Details! Saturday September 24th - Vendor Fair! More details to Come! As we approach opening day, I reflect back on the progress of the last year and really cannot say thank you enough to all the friends, family, and supporters we’ve had cheering us on along the way. Who knew in such little time we’d have built such a great support system of neighbors, community organizations, retailers, and even over 400 Facebook followers! At every event we attend, we love meeting new people and sharing the story of how our dream is slowly becoming reality, but we couldn’t do it without you! Most nights after working in the barn, we come in feeling dirty, sweaty, exhausted, and overwhelmed wondering how we are ever going to complete this project, but then we remember how blessed we are – as I said in our very first post – to see the face of that old brick barn glowing in the yard light – know that every day is a step closer to opening day! But enough with the sappy stuff. We would like to officially announce and welcome you to our Grand Opening celebration Saturday, May 21st from 11am to 6pm. You’ll be able to try our wine selection, have a glass of your favorite wine with your friends or family, hang out in the tasting room, and even take a bottle or two with you to enjoy at home! 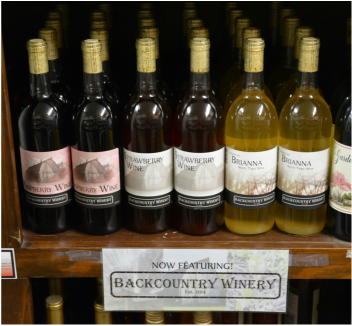 We’d also love to talk to you about hosting your own event at Backcountry Winery this summer! Hope to see you there! Our 2015 wines are well underway and will soon be ready to bottle. As our line continues to grow, we’ve been focused on branding and what exactly we want these mysteriously delicious things we’re creating to look, feel, and taste like. When designing labels for the new wines, I focused on sharing our story and the inspiration behind all of our hard work – the Backcountry! The names and photos on the labels have their own story to tell from one of our crazy adventures across America. We can’t wait to share these stories with you while enjoying a glass (or two!) at the winery on opening day! After taking some time to enjoy the holidays, we’re ready to hit the ground running in 2016. 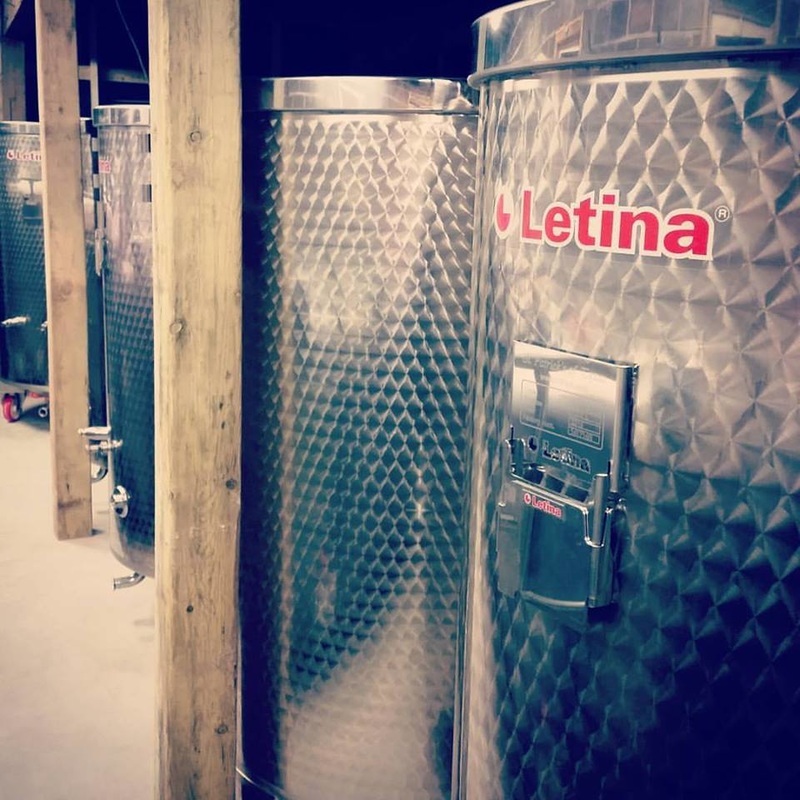 In the last couple months, the wine has really taken center stage on our priority list, but we’ve also been able to accomplish a few other tasks, with the help of family and friends. The stairs are now welded in place, ready for railing and concrete – Thanks Mom, Dad, and Devan for coming to help! The bathroom framing is going quickly and we’re hoping to have walls and fixtures in the next couple weeks! We’ve added some lighting in both the hay loft and tasting room and are starting to think about plumbing. We placed our order for corks and bottles – and both have arrived as of last week! We were very thankful to be able to get our bottles in the barn Tuesday night, just before the rain and snow came. This weekend I’m excited to be attending our FIRST bridal fair – come out and see us at the Webster County Fairgrounds for the Wedding Extravaganza from 12-4pm on Sunday, January 3rd. We’ll have our booth decorated and our calendars out, ready to book your 2016 event! If you have an event in mind (Bridal shower, anniversary or birthday party, or just a girl’s night out), send us a note at backcountrywinery@gmail.com to get your reservation in! I’ll be posting our pricing information to our website. This week has been the BIGGEST at the winery to date – our 2016 Season of wine making has finally begun. After months of discussing, planning, researching, changing our minds, and more discussing, we now can proudly say our wines have begun fermentation. Brianna – This sweet, fruity white wine with hints of pineapple and tropical fruits has won our hearts and earned itself a ‘permanent’ place on our shelves. While supply was difficult to find this year, we’re sure you won’t be disappointed. Frontenac Gris – This juice came as a last minute surprise for us from Hinterland Vineyards in Clara City, MN (Thanks Aric and Aftan!) This ‘gray’ grape comes from the University of Minnesota Horticultural Research Center and produces a golden color, light, refreshing, and mildly fruity semi-dry wine. We’re hoping you love it as much as we have! Catawba – This red grape – one of the earliest in American wine making dating back to at least the 1800s - produces an intensely fruity sweet rose that goes perfectly with a hot summer afternoon on the porch swing. Raspberry and Cherry – These two fan favorites will make a comeback in next season’s line-up to provide those fun fruity flavors perfect for a sangria or summer bbq! Apple – Picture this: Your favorite worn-in pair of jeans and flannel shirt, the crisp smell of fall leaves and harvest in the air, enjoying the last bonfire of the season with your favorite friends and family and a glass of apple wine to top it off! We’re sure this will be a big it for all you fall lovers like me to enjoy year ‘round! Marechal Foch – Named after a prominent French soldier in World War I, this versatile red grape offers full body and great fruity flavors with only a hint of ‘earthy’. Frontenac – Also from Hinterland Vineyards (and originally released by the U of M as well), this full bodied semi-dry red wine round out our offerings with hints of black current and cherry flavors. We’re also working on a couple blends, to be announced soon! Can’t give away all the goodies right away (truth be told – we’re still working on the clever names for them all)! Our tanks came in yesterday, and we spent all night taking off the MANY layers of packaging so they could be assembled, sterilized, and filled! Check out these beauties! This weekend’s goals: Finish septic system and continue work on HVAC, lights, and, of course, the wine! Well, it’s about time, right? Time for me to stop procrastinating and write the first update in over three months! I know I’ve said this before, but time really goes too fast. Last time I checked in we were getting ready to celebrate the 4th of July and now that and Labor Day have both passed without a chance to look back on how far we’ve come! I hope you’ve been watching our Facebook Page for our occasional posts and photo updates. Since July, we have hosted several tastings at our retailers, and are excited to announce our newest event in conjunction with the Webster City Community Theater’s Fall Production of ‘Drinking Habits’. Join us before the show on October 10 for a sampling! Can’t wait to see you there! Our Facebook page reached over 300 likes – thanks everyone for your support of our crazy adventures! 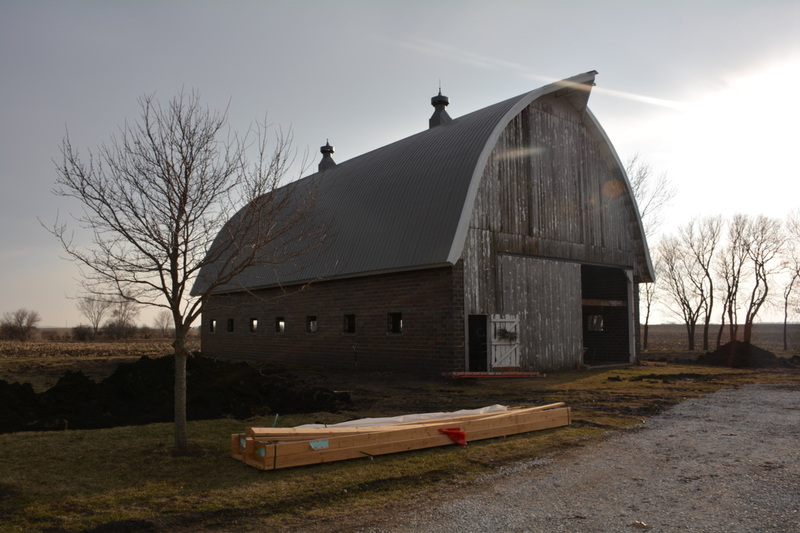 We took the old wood of the front of the barn (saving as much as we could, of course!) and replaced with fresh siding – check it out, isn’t it beautiful? We do still need to get the final coat on, but are now waiting for a good frost to get rid of those little black bugs that are loving our fresh white paint. I think we’ll also be adding our logo to the front in the spring – stay tuned. 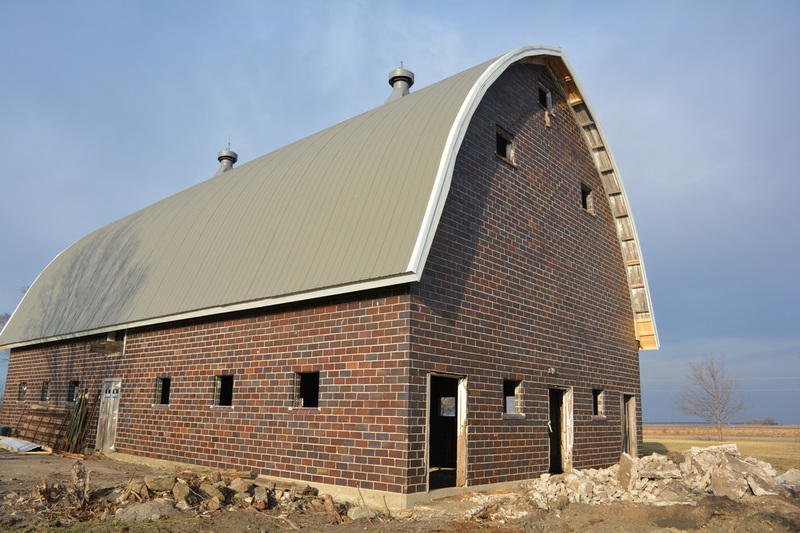 With windows, doors, and siding installed, the barn is very close to being ready for *winter* - even though I’m not ready yet to give up this beautiful fall weather. With the barn enclosed and lit (it gets dark at 7:30 already!?! ), it’s challenging now to go in for the night or take a ‘rain day’ knowing there are things we CAN be doing inside. We also had the new flooring for the hay loft delivered in July and as of last night I can OFFICIALLY say it is installed. Now, we move on to setting those few stray nails, lightly sanding, and finishing. Stairs will also be added in the next month or two which will be FANTASTIC in comparison to the old barn ladder we’re using right now (though, the barn ladder has some great character – any ideas on what we can use it for???) Story City Building Products has been AWESOME to work with and have provided us great products and support for our project– Thanks for all your help Bob and Clint! 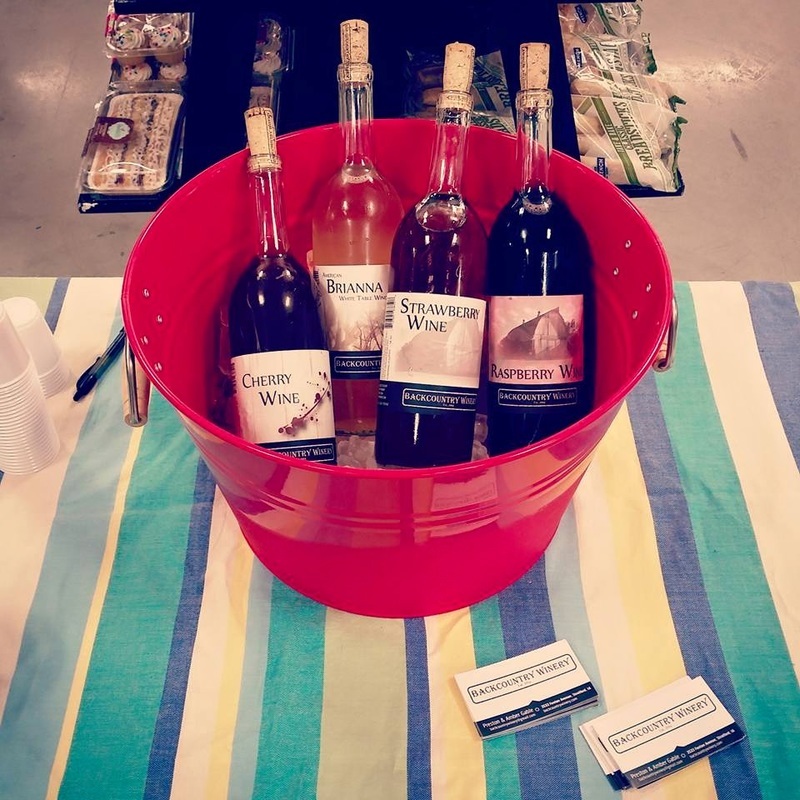 We added Boone HyVee to our roster of amazing local retailers carrying our product – so if you’re in the area, check out their amazing Iowa Wine selection and take a bottle home! We harvested our better-than-expected crop of hops and should have enough to make a couple batches of beer (for personal use) this winter. I think I’ve decided beer making is a great winter sport – sitting by the kettle for hours just calls for a cup of hot chocolate on a snowy day. Our vines continue to grow and exceed our expectations every day. Check out the photos. We’ve basically done all we can for them this year with training, and we’ve hardly had to irrigate at all. Now, we wait until mid-to-late winter to begin pruning and getting them ready for the next growing season. Whew… Yes, we have been busy. BUT that doesn’t mean we don’t take some time every once in a while to enjoy ourselves and take on new adventures outside of the winery. In September, we hit the road for a week out west for some extreme hiking and canyoneering in Utah and Wyoming. I really do believe we saw some of the most beautiful places on earth! We hooked up with Rick and Amie from Excursions of Escalante to take a two-day Canyoneering course and learn the basics – and they were beyond awesome. Really – they went out of their way and made our trip even that much more memorable. Check out the photos. Even though we ran into a little rain (other parts of Utah had some very serious flash flooding the week we were there), it wasn’t enough to stop us from having a great time and learning a ton about how to explore and stay safe in the canyons. Thanks Rick and Amie – you guys are the best! Before and after our canyoneering adventures, we were also able to spend some time in Arches, Bryce Canyon, and Zion National Parks. ​After spending a night in Salt Lake City and checking out some of the sites there, we made our way north to Jackson, WY to take on our hike in the Tetons that defeated us when we were there in 2013. Our ~20 mile round trip hike up Paintbrush canyon, over Paintbrush Divide (elevation 10,700 feet!) and down Cascade Canyon was… challenging, to say the least. And the photos absolutely do not do it justice. We left the hotel on a brisk Friday morning before sunrise to take the short drive to the trailhead and begin our ascent. We stopped a couple times (ok, maybe more than a couple!) to catch our breath and capture the views. It took us until about 3p.m. to follow a single set of footsteps up the last mile or two through knee-high snow and make it to the divide, so we were very thankful to be camping just down a bit on the other side and not making the trek back that same day. We set up camp, cooked a well-earned supper, and were in our sleeping bags by 7:30 to warm up and rest up for another long hike in the morning. Our jeans and shoes were wet from the snow, so we set them outside hoping they may dry a bit before we needed them in the morning. But, with the below freezing temperatures, we woke up to find them still saturated and now frozen almost completely solid. We made a quick breakfast around 8:30 (yes, we slept for 13 hours!) and decided we might as well begin our down to Jenny Lake, where we would take the ferry back to the car. Both canyons were absolutely beautiful - with the changing falls color in contrast with pine and spruce trees, and the snow at the divide fit in just like a cherry on top. But to me, nothing tops the view we caught of a mother black bear with her two cubs by the mountain stream, eating roots to get ready for winter. I don’t think I’ve ever seen a bear in the ‘wild’, and I wasn’t sure if I should be scared or excited, but they were so content, even graceful as they wandered and ate. You could just tell they truly felt at home and were paying no attention to the small crowd of hikers that had gathered to observe. I’ll admit - all throughout the trip my heart ached to live in a place where all those parks and beautiful views were right there at your fingertips, but something hit me on that hike down (maybe it was the cold weather, wet feet, blisters, and hunger for good Iowa beef), but I realized that Iowa was where I belonged and I was ready to get back home. The ‘Backcountry’ (however you define it, and wherever it is that you are) is what inspired us to follow our dream and build the winery. When you’re there, feeling like you can accomplish anything if you just take one step at a time, you feel so motivated and inspired - it’s a feeling you want to capture and never let go! So now we’re back in Iowa, and I’m already reading up and planning our next trip to the Backcountry, but it feels good to be home and continuing to chip away at projects in the process of making our dream a reality! If it involves Fireworks, Summer Nights, BBQ, Beer - or WINE - and Freedom, Count me in! This summer has been too good to us so far. Really. We've been enjoying it so much that it's hard to believe the 4th of July is already less than a week away. We also celebrated a huge milestone in our journey by getting our first bottles on the retail shelves just in time for Memorial Day Weekend! Everything has been going great and we couldn't be more thrilled to be working with such great local retailers. You can find us on the shelves at Stratford Food Center, Jamboree Foods, and Fiesta Foods. And we are hoping for more coming soon! Finally, we're celebrating our most recent accomplishment tonight by power-washing the barn walls and cleaning up our NEW FLOOR! The crew came Saturday Morning to pour concrete and we are so happy with the final result! JB Concrete did a phenominal job and again, we can't wait to share the final product with you! Here's a few photos of the progress to wrap things up - final photos to come soon! On that note, I think we are truly ready for a long weekend celebrating our accomplishments and our pride in the Red, White, and Blue! Have a safe and enjoyable 4th! Progress Report: We have vines! Where did the month of April go? It's hard to believe time has gone by so fast, but we've gotten quite a bit accomplished and continue to make progress every day. We started the month by celebrating Easter with family in Northwest Iowa and making the trek to Rochester, MN the following weekend to celebrate the wedding of Chloe & Eric - we had a blast! It was so great to catch up with everyone we hadn't seen in so long and was a truly welcome break from 'reality'. But at that point, in just under a week, our vines would be arriving and we had to get to work! We (I) had originally planned to have the trellising installed before vines would be planted, but after the first, (and second, and third) night of attempts at drilling holes in the dark and fighting auger malfunctions, we soon realized it was a bigger task than we had originally anticipated. Our vines arrived from Double A Vineyards Thursday evening and they were beautiful! As beautiful as dormant 'twigs' with their dirty bare roots exposed could be! We soaked them in water overnight and were up with the sun Friday to begin our big day of planting. 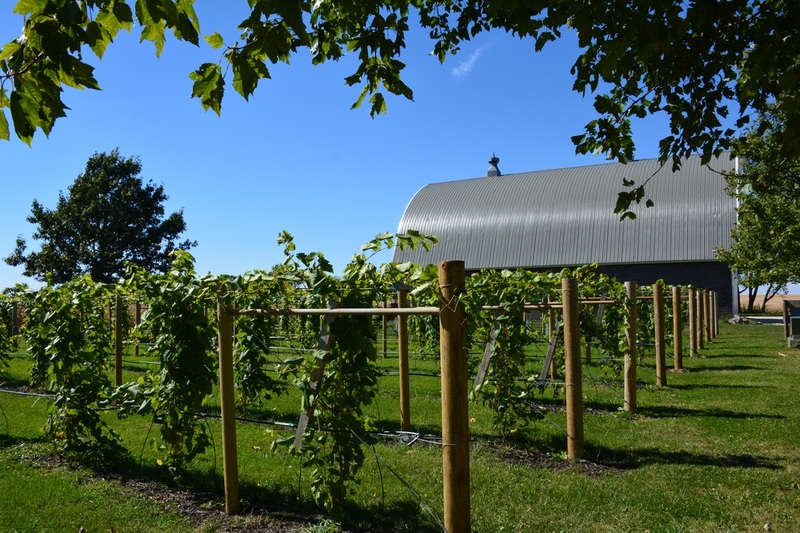 I also forgot to mention that 'Planting Day' was also the day our electricity to the barn would be connected, our new light pole would go in, and our hops trellising (Oh by the way, we planted hops too!) would be installed. So, I began by marking the grape vine holes and Preston followed with the auger to drill them. I came back through to distribute and plant in the 'downtime' when Preston was helping direct other events of the day. It turned out to be a beautiful day - nearly 80 degrees and sunny. Both of us ended up sun burnt and exhausted, but it was worth it. We wrapped up our planting around 4:00 that afternoon, just in time to enjoy beers and burgers with neighbors and friends - a great way to end the day! Maybe some of you are wondering if grapes really will survive in Iowa or if we've truly lost it at this point! We consulted with ISU Extension (Thanks Diana and Mike!) and talked with numerous other wineries and growers in the state to narrow down which cold hardy varieties would be best for our location. We chose to grow: Brianna - a white wine grape that has been one of our favorites since our beginning; Frontenac - a more full bodied, earthy red wine grape introduced by the University of Minnesota, so you know it's cold hardy; Frontenac Gris - a 'gray' fruit producer that lends itself well to a 'rose' wine; and Frontenac Blanc - the most recent discovery (released in 2012) that produces a white wine grape with a distinctly beautiful flavor that we can't wait to share with everyone! Grapes are EXTREMELY Sensitive to 2,4-D and other herbicides, so we're asking everyone to spread the word and help sensitive crop growers everywhere protect their produce! This also means we're going to have to embrace the dandelions in the vineyard until the vines are more established. At that time we can pursue alternative methods for taking care of them! If all goes as planned, we will spend two complete growing seasons training and pruning our new little friends before we finally harvest our first crop in 2017. We've [nearly] finished the trellising and set up irrigation, though the rains the last two weeks have really been a blessing and we haven't had to use it yet. Check out these little guys - we're pretty excited about them! Spring has sprung! 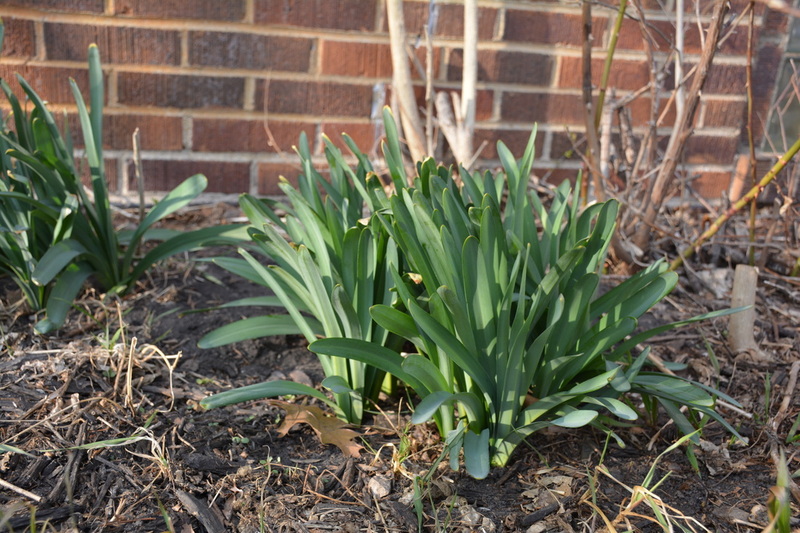 Our daffodils are up and lilacs buds are swelling - it's finally here! We celebrated the first day of spring 2015 with Mom and Dad, who came for the weekend and helped give a boost to our progress! After a ‘power-breakfast’ at the local bakery, we got right to work (11 a.m. is still ‘first thing’ in the morning, right?) 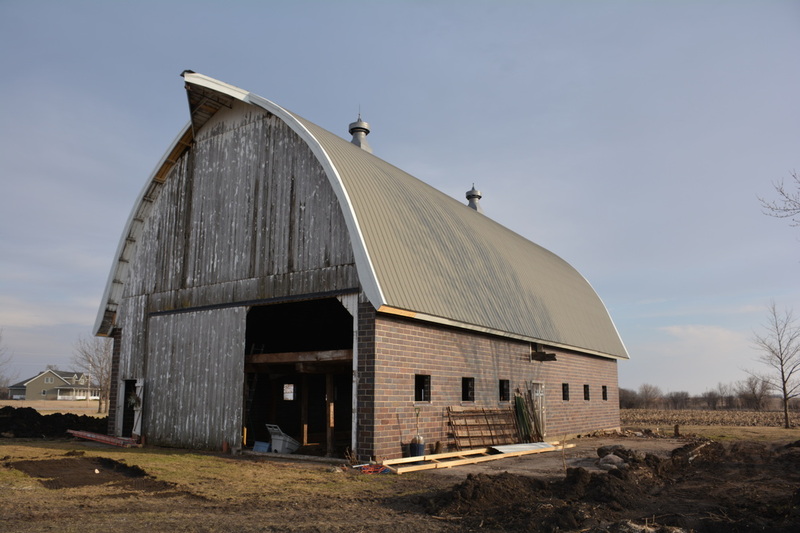 We began by cleaning out what miscellaneous things were still left in the barn and rearranging our tool staging area so we could remove the timbers that made up the floor on the east side and prepare for gravel and concrete. We took many trips of ‘save-ables’ to the corncrib for storage, and many more trips to the burn pile. These large timbers from the floor were wet (and some still a bit frosty – due to the winter melt from what was an extremely leaky roof) and because of this were extremely heavy (Thanks dad for being there when we needed you!) He even went on to remove the last bit of hay loft floor before cleaning up and calling it a day! Mom and I cleaned up the last bit of scraps from the roofing contractors. I ran a magnet over the area and found more rusty nails than I ever thought possible – but it was good to pick them up in hopes they won’t make it into one of our tires as we continue work on the exterior! 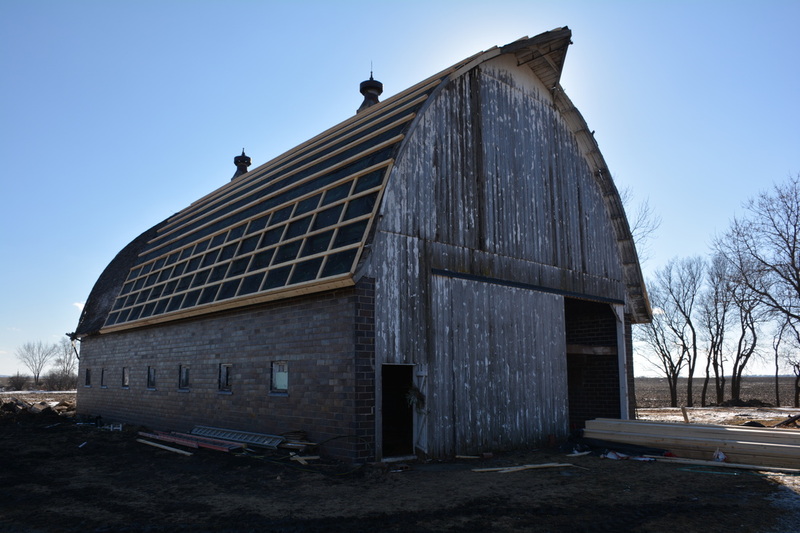 The roofers worked all weekend and are done with all but a few small pieces of trim – check out this beauty! Holder Construction did a phenomenal job on the roof and we couldn’t be happier with how it turned out – Thanks guys!!! Preston worked in the backhoe this afternoon to dig in our underground wire to get electricity to the barn while I finished cleaning up around the barn and taking care of some spring maintenance in the yard. The driveway extension is almost completely prepped and ready for gravel as well. We had a great weekend and can’t wait to continue making our plan reality! 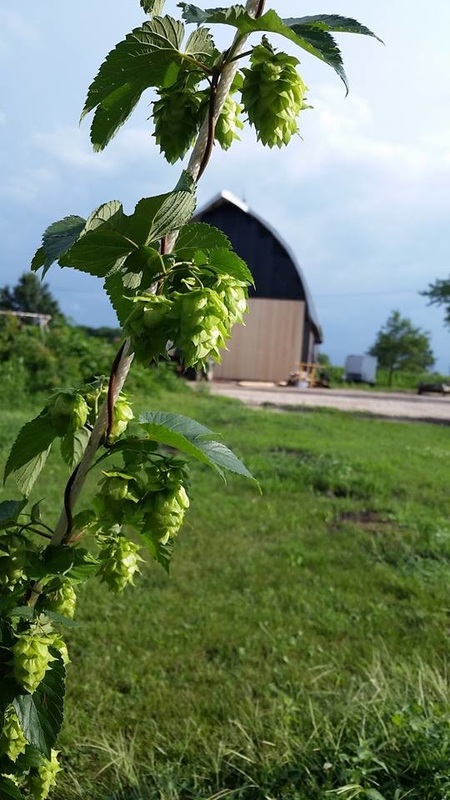 Next on our list: Order windows, pour post foundations and get gravel in the barn and packed for concrete floor, get our Label approvals (yes, we’re still waiting! 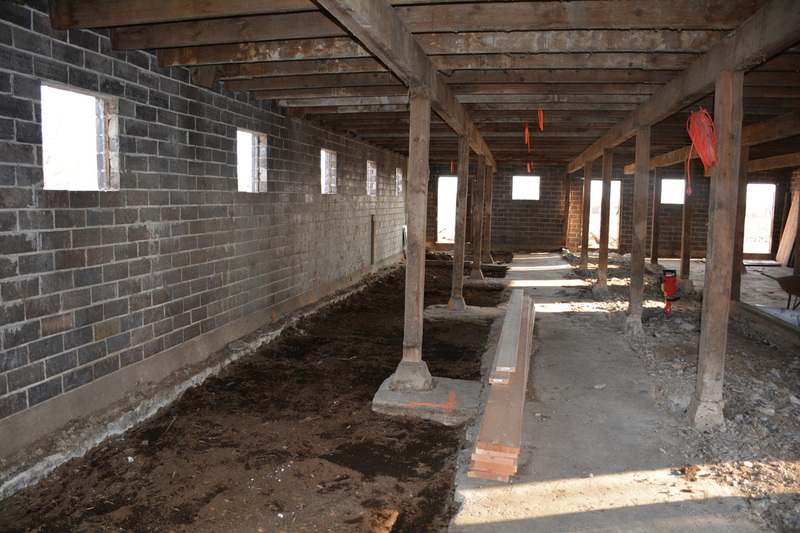 ), find a source for wood for the hay loft floor, and promote our Kickstarter! There are only 9 days remaining in our Kickstarter Campaign and we’re currently just over 20% funded – if you haven’t gone to check out our awesome reward packages, please follow the link (https://www.kickstarter.com/projects/376508458/backcountry-winery?ref=email) and consider supporting our efforts – we truly appreciate and can’t wait to share the space with you upon completion! Wish us luck this week and stay tuned! We’ve been blessed again this weekend with beautiful weather and signs that spring might FINALLY be on its way! We’ve been moving pretty slow outside the last few weeks due to the cold, and were anxious to get back into the barn and keep moving. The roofers have been busy this week and we’ve been told we might actually see the steel go on very soon. Here is what it looked like as of yesterday – we’ll take more pictures as they continue work this week and keep you posted! Last Saturday we drove to Cedar Rapids to attend the Iowa Wine Grower’s Association’s Annual Conference. The Iowa Wine Growers Association supports the Iowa Wine Industry through education, promotion, and legislative support. Their annual conference provides members the opportunity to attend great presentations given by experts from around the world. As new comers to the industry and to the association, we weren’t sure what to expect, but it turned out to be a great day full of educational opportunities and excited discussion about how we can apply our new knowledge to our own winery plans. Meeting new people in the industry and listening to all the great advice they were so willing to share with us was also amazing – it truly feels like big family and we had a blast getting to know everyone. We’re already looking forward to next year. 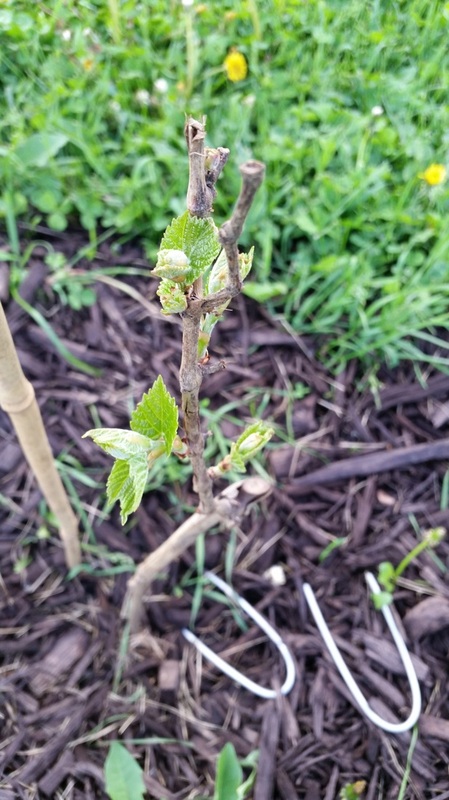 After attending the confe rence and doing a bit more research when we got home, we’re getting ready to order our grape vines for planting this spring. 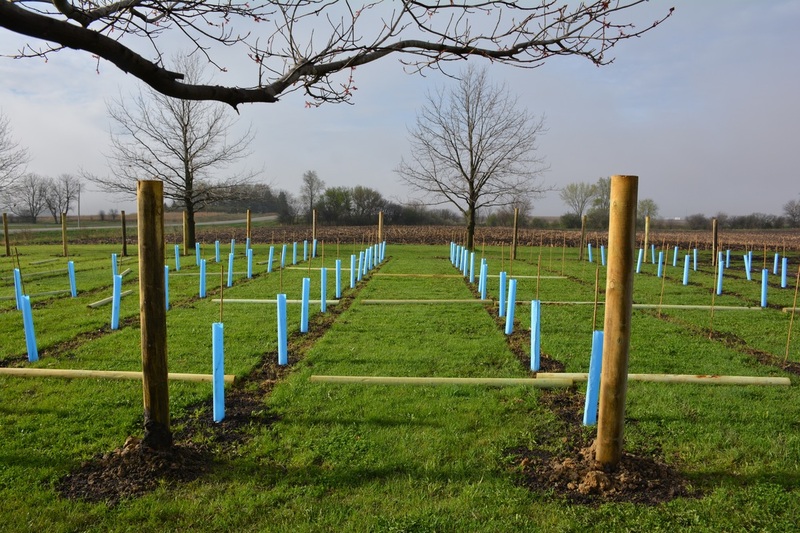 We’ll plant 150 plants in approximately ½ acre near the barn so we can have easy access to water and equipment and be able to keep a close eye on them as they mature. We’ve selected a wide range of cultivars – both whites and reds – and though it will take some serious time and hard work before we’ll be harvesting from these vines, we’re looking forward to it! Another milestone for us since attending the conference was launching our Kickstarter Campaign. Kickstarter is a company, founded in 2009, that allows creative spirits [that’s us] to share our ideas and goals on their website to seek out and earn financial support. Since their launch, 8.1 million people have pledged over $1.6 Billion to successfully fund nearly 80,000 projects like ours – that’s impressive! We’re offering some great rewards so please check them out and back our project if you like what you see! We have 23 days remaining and we’ve reached 10% of our goal. We truly can’t do it without you and we can’t wait to share our winery with all of our supporters!